This case is just a small part of a larger problem at UCLA. Another small part of the problem, the behavior of Eugene Washington, dean of the David Geffen Medical School at UCLA, is discussed HERE. "Shortly before Pedowitz joined UCLA in 2009, the university was already facing criticism from Congress over the failure of a top spine surgeon to report nearly $460,000 in payments he received from Medtronic and other medical companies while researching their products' use in patients, government records show. "Dr. Jeffrey Wang, who left for USC Spine Center last fall, stepped down as head of UCLA's spine program in 2009 after U.S. Sen. Charles Grassley (R-Iowa) publicized his lapse in disclosure as part of a larger investigation into medical conflicts of interest. "Several patients are now suing Wang and UCLA in state court for negligence, fraud and malpractice in connection with surgeries involving Medtronic's controversial Infuse bone graft." "...'What good are all the policies if they protect the wrongdoers and fail to protect the actual whistleblower?' Quigley said. 'The university wanted to cover it all up.'" University of California regents agreed to pay $10 million to the former chairman of UCLA's orthopedic surgery department, who had alleged that the well-known medical school allowed doctors to take industry payments that may have compromised patient care. The settlement reached Tuesday in Los Angeles County Superior Court came just before closing arguments were due to begin in a whistleblower-retaliation case brought by Dr. Robert Pedowitz, 54, a surgeon who was recruited to UCLA in 2009 to run the orthopedic surgery department. In 2012, the surgeon sued UCLA, the UC regents, fellow surgeons and senior university officials, alleging they failed to act on his complaints about widespread conflicts of interest and later retaliated against him for speaking up. UCLA denied Pedowitz's allegations, and officials said they found no wrongdoing by faculty and no evidence that patient care was jeopardized. But the UC system paid him anyway, saying it wanted to avoid the "substantial expense and inconvenience" of further litigation. As department chairman, Pedowitz testified, he became concerned about colleagues who had financial ties to medical-device makers or other companies that could unduly influence their care of patients or taint important medical research. He also alleged that UCLA looked the other way because the university stood to benefit financially from the success of medical products or drugs developed by its doctors. One of the orthopedic surgeons that Pedowitz complained about testified at trial about receiving $250,000 in consulting fees in 2008 from device maker Medtronic. In memos to university officials, Pedowitz raised concerns about the financial dealings of other doctors as well. Inside the courtroom Tuesday, Pedowitz sat in the front row with his wife and daughter as the judge told jurors that a settlement had been reached. He said he felt vindicated by the outcome. "These are serious issues that patients should be worried about," Pedowitz said in an interview. "These problems exist in the broader medical system and they are not restricted to UCLA." The seven-week trial in downtown Los Angeles offered a rare glimpse into those potential conflicts at a time when there is growing government scrutiny of industry payments to doctors. Starting this fall, the federal Physician Payments Sunshine Act, part of President Obama's healthcare law, requires public disclosure of financial relationships between healthcare companies and physicians. Many doctors and universities defend long-standing industry arrangements as essential for carrying out cutting-edge research and top-flight medical education. In a statement Tuesday, the UC regents said they "resolved this lawsuit to end a prolonged conflict and permit UCLA Health Sciences to refocus on its primary missions of teaching, research, patient care and community engagement." The statement added that "multiple investigations by university officials and independent investigators concluded that conduct by faculty members was lawful. Patient care was not compromised." This latest settlement eclipses a $4.5-million payout the UC regents made last year to resolve a racial discrimination lawsuit filed by another UCLA surgeon. Pedowitz, as part of his settlement, left the UCLA faculty, effective Tuesday. He had agreed to step down as department chairman in 2010 after initially voicing his concerns to top UCLA officials. He filed a whistleblower retaliation complaint in March 2011. Experts in medical ethics say the UCLA case shows much more needs to be done within academia and by government regulators to address potential conflicts of interest in medicine. Susan Chimonas, associate director of research at Columbia University's Center on Medicine as a Profession, said some medical schools are still reluctant to take on specialists who bring in considerable money from patients, medical research and patents on breakthrough products. "Institutions can be dependent on the money these big-earning specialties like orthopedic surgery bring in," Chimonas said. "They are the cash cows and they can set their terms. This is not the first time I've heard of medical schools having policies that are not well enforced." In an interview last week, the chief compliance officer at the UCLA Health System flatly rejected the notion that the university didn't enforce its policies or look fully into Pedowitz's allegations. She also said industry ties are unavoidable at a big medical school and rules are in place to prevent conflicts. "We have processes in place to identify those relationships in a transparent fashion and ensure they don't have any inappropriate influence on the actions of the university," said Marti Arvin, chief compliance officer. "In order to meet our mission, it is important we have both the brilliant minds we have at UCLA and collaboration with industry." Arvin said the university "thoroughly and objectively investigated those allegations of noncompliance raised by Dr. Pedowitz. We were able to determine the vast majority were unsubstantiated." She said two doctors fell short of university expectations in their handling of outside income, but there was no violation of law or university policy in either instance. Arvin cited the case of Dr. Nick Shamie, the orthopedic surgeon who testified at trial about receiving $250,000 from Medtronic for consulting work. She said department policy at the time didn't require Shamie to send that outside income through UCLA's faculty compensation plan. At trial, Pedowitz said he was deeply troubled by the large amount of money Shamie was paid. He testified that he was particularly concerned that Shamie was trying to enroll patients in a research study involving Medtronic at the time. "I saw this as an obvious problem," Pedowitz testified. In court, Shamie said he abided by university policy and didn't pursue the study further because finding patients was too difficult. He couldn't be reached for additional comment. The other physician cited by Arvin for a potential shortcoming was Dr. David McAllister, vice chairman of clinical operations for the orthopedic surgery department. He didn't report payments from the Musculoskeletal Transplant Foundation, a nonprofit tissue bank that does business with UCLA, because he didn't think disclosure was required in that instance because it didn't involve a for-profit entity, Arvin said. McAllister also declined to comment, referring a call to UCLA. Shortly before Pedowitz joined UCLA in 2009, the university was already facing criticism from Congress over the failure of a top spine surgeon to report nearly $460,000 in payments he received from Medtronic and other medical companies while researching their products' use in patients, government records show. Dr. Jeffrey Wang, who left for USC Spine Center last fall, stepped down as head of UCLA's spine program in 2009 after U.S. Sen. Charles Grassley (R-Iowa) publicized his lapse in disclosure as part of a larger investigation into medical conflicts of interest. Several patients are now suing Wang and UCLA in state court for negligence, fraud and malpractice in connection with surgeries involving Medtronic's controversial Infuse bone graft. UCLA said it doesn't comment on pending litigation. Wang couldn't be reached for comment. Shortly after raising his concerns, Pedowitz said, he was pressured to step down as department chairman in 2010. Pedowitz said he was further retaliated against by being denied patient referrals and prevented from participating in grants and other activities. Before UCLA, Pedowitz worked at UC San Diego and as chairman of orthopedics and sports medicine at the University of South Florida. 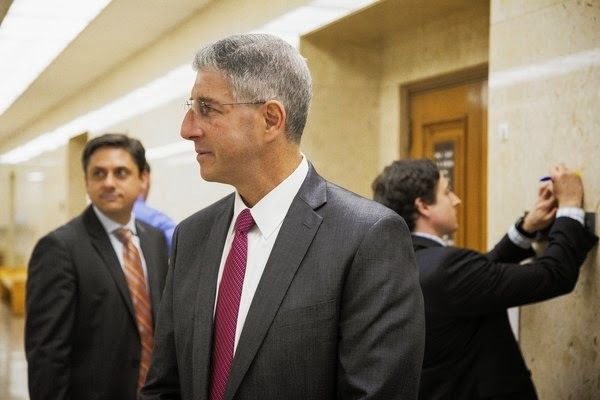 Mark Quigley, an attorney representing Pedowitz, said the case could have been avoided if the UC system enforced the policies it already has in place. "What good are all the policies if they protect the wrongdoers and fail to protect the actual whistleblower?" Quigley said. "The university wanted to cover it all up."